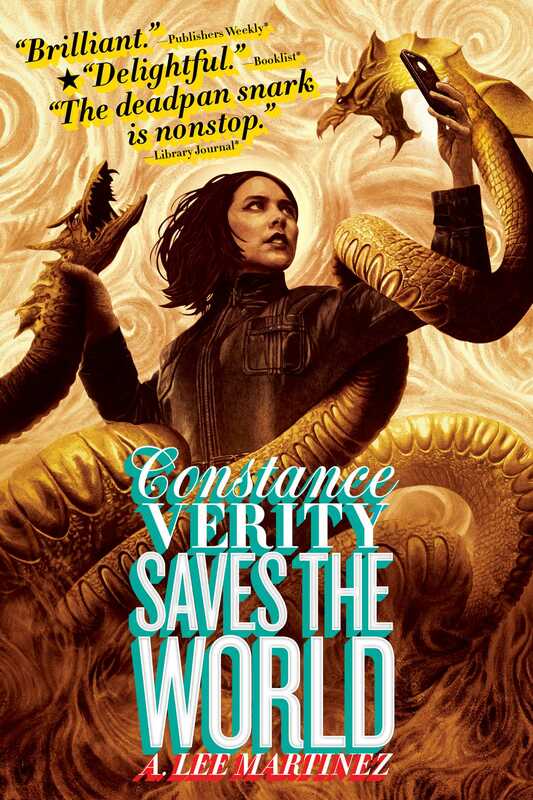 For Constance Verity, saving the world isn’t the hard part. It’s keeping her new, ordinary life from falling apart along the way that’s going to be tricky. This is the next book in the witty Constance Verity trilogy, which Booklist named a Top 10 SF/Fantasy book of 2016. Constance successfully became an ordinary person. People warned her it would be boring—and they were right. That’s exactly why Connie loves it. But there’s an Adventurer-shaped hole in the cosmos now, and a lot of interested parties eager to fill it. Not all of those candidates are fit for the role, and if The Adventurer falls into the wrong hands, it can lead to chaos and destruction. Constance still has all the skills of her old life, but she’s no longer chosen. Yet when the fate of the world is at stake, she sets off, reluctantly, to keep the forces of evil from stealing the destiny she abandoned. It was date night, and Constance Verity was wrestling an alligator woman in her underwear. How the alligator woman ended up wearing Connie’s underwear was a mystery she never solved. Connie herself currently wore a towel, rolling around on the floor with her opponent. She’d wrestled people and alligators, but not a combination of both at once. It was trickier than she expected. Several times, Connie had the alligator woman locked down, only for the woman to use her tail for leverage or almost bite Connie’s face off, forcing a withdrawal. She did not have time for this. Byron would be there in a few minutes. He would be on time. He was always on time. Usually early. It was one of the things she admired about him, but it also meant she couldn’t spend all night subduing her opponent. She hadn’t even picked out her outfit yet. Connie wrapped her legs around the alligator woman, choked her out with a full nelson. It took precious minutes for the alligator woman to lose consciousness. The moment she went limp, Connie rolled her over, grabbed some rope she kept in her sock drawer, and hogtied the intruder. In Connie’s life, it often paid to have some spare rope lying around. The alligator woman rolled around on the floor. She growled and hissed and snapped her toothy jaws. Six minutes to get ready. Connie made a call. She didn’t wait for the person on the other end to say anything. “Who is this?” asked Agent Ellington. “You know damn well who this is,” said Connie. “Is Agent Harrison ever coming back?” asked Connie. Connie ended the call. Four minutes. She grabbed something easy out of her closet. She’d never been a high-fashion kind of lady. When many little girls were planning their wedding, she’d been exploring the seventh dimension and escaping robots. Comfort was preferred over style in such situations. She was able to get dressed in twenty seconds flat, a skill she’d picked up along the way. She brushed her teeth and ran a comb through her hair. She’d been toying with the idea of makeup, but that was another thing she didn’t have much experience with. She could disarm fourteen kinds of bombs, but she still tended to overdo the rouge. Three minutes. Plenty of time. The alligator woman rolled to one side, bumping into a chest of drawers, knocking a lamp off the top. Connie’s reflexes sprang into action. She caught the lamp, set it down safely. “If you don’t stop squirming around, I’m going to have to knock you out again,” she said. Connie knelt down and pressed her thumb on the alligator woman’s throat. The press itself was less important than the channeling of inner chi to stifle the flow of vitality. The woman passed out. Byron was early. Connie hopped over the woman and shut the bedroom door behind her. He wore a gray suit. He must’ve come straight from work. His necktie was crooked. He couldn’t get it right to save his life. It was one of the things she found endearing about him. One of many things. He leaned in and kissed her. He ran his finger across a scrape on her forehead. One several days old. “Trouble in the Congo?” he asked. “Antarctica,” she corrected. “And nothing I couldn’t handle.” She took his hand and pulled him out of the apartment. She heard the edge in her voice, but hopefully, Byron wouldn’t notice. “Something wrong?” he asked. Okay, so maybe he would. She didn’t like lying to him. She didn’t do it often. She didn’t need to. He knew all about the other half of her life, but Byron wasn’t part of that. Just like she didn’t know a lot about his accounting job. “We’ll talk about it at the restaurant,” she replied, although she had no such intention. She pushed him into the bathroom and checked on the alligator woman—still thankfully unconscious. Byron came out a few minutes later. “We’ll talk on the way.” She maneuvered him out the door. Once in the hall, she breathed easier. “Neighbor got a new dog,” said Connie as she led Byron down the hall. At dinner, her attempts to change the subject met with resistance. “Don’t act like you don’t do it,” he said. “Can we not talk about this tonight?” she asked. Sure, she could. She could do anything. Back at her place, she checked her bedroom. The alligator woman was gone, but a strange red fog was spilling out from her closet door. Byron came up behind her and put his arms around her. He kissed her neck. She shut the bedroom door and led him toward the couch. He didn’t question. They made out for a few minutes until he stopped. “What? No. I’m totally into this.” She grabbed his head and planted a deep, passionate kiss on him. His concerns melted away as she ran her hands up his chest and curled her fingers through his hair. She was unbuttoning his shirt when she noticed the wisps of red mist creeping from the edges of her bedroom door. This problem wasn’t going away. Her problems rarely did. “Do you mind if we call it a night?” she asked. Cuddling sounded great. More than cuddling sounded even better. But worlds were colliding, and she needed to avert that. She shoved Byron out the front door. He put up surprisingly little resistance, which was helpful but bothered her a little. “Connie, we need to talk,” he said. She cringed. They needed to talk. Across infinite dimensions, endless time, and boundless space, nothing good ever came of needing to talk. “Great. Next time.” She shut the door and waited for him to knock. Again, she was both relieved and disappointed. Her bedroom door burst open and more fog spilled forth. A massive warrior wearing a loincloth snorted at her. He narrowed his cruel, red eyes and snorted. The warrior threw an axe at her head. She ducked aside and the weapon buried itself in her door. She wrenched it free and swung it over her head. The balance was off, but she could work with it. Relationships were complicated, but this was easy. The warrior hurled himself forward, and she rushed to meet him. The next day, she met Tia over drinks and shared her aborted date night. Connie mumbled something. Even she wasn’t sure what it was. “We’ll schedule something, then,” said Connie. Connie was certain they didn’t. She’d never done anything to them. She’d only exchanged a few words with most of them, but she always sensed an aura of hostility. It must’ve been simply a lifestyle clash. She was an adventurer. They were in the insurance game. Like oil and water, but with the oil also being on fire and wrestling bears and getting in gunfights and stuff that any rational insurance adjustor wisely avoided. “You’re making excuses,” said Tia. Connie didn’t like the idea of Byron meeting her ninja ex-boyfriend. She wasn’t too keen on Byron meeting Tia, either. Tia was a normal person, but by virtue of being Connie’s oldest friend, Tia had also accumulated her share of unusual experiences. The thought of the four of them sitting at a table filled Connie with dread. “It’ll be fun,” said Tia. She sucked a deep breath through her gritted teeth. Connie’s hands fell to her side, and she stared in exasperation at the ceiling. The kitschy bric-a-brac hanging over her head, especially an old-timey bicycle, irritated her for some reason. Just by being there. Just because it was so obviously there to be kitschy. Connie’s normal romantic relationships never ended well. She was usually too busy to be bothered by the breakups, but the guys who were eaten by monsters still haunted her now and then. Since removing most of the magical blessing that had defined Connie’s life, she’d still been drawn into adventures, but it was more in her control now. She could even ignore them, and they’d sometimes go away on their own. She had something resembling a quieter life now. Quieter than it had ever been before. 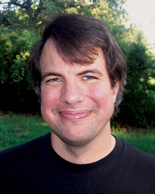 A. Lee Martinez enjoys juggling, origami, skulking, and time travel.